Legends say that when it snows, the Snow Princess is weeping and that a tragedy is about to occur. This is the bond shared by the three short stories in the manga collection of "Shirahime-syo" by the all-female group of CLAMP. Although that premise has the potential for some really heartwrenching stories, CLAMP stops short of exploring those possibilities. Instead, the tales are formulaic, with predictable outcomes. The best story is the first one, "On Wolf Mountain," which tells of a young woman, Fubuki, who goes to the snowy mountain to find the wolf that killed her father and avenge his death. The tale progresses in a by-the-numbers fashion: Fubuki is attacked by wild dogs and is saved by the very wolf she came to kill. She doubts he was responsible for her father's death after all, and they become friends. But in the tragic end, the story offers a different view of the wolf's actions and gives no hint of which perspective is the true one. The second story, "The Ice Flower," tells of the parting of two lovers and the young woman Kaya's promise to wait for her love to return. More than 30 years pass and her beloved, though doubting Kaya's loyalty after such a long time, makes his way toward their rendezvous point. He discovers she did keep her vow -- and the price that both of them paid for her fidelity. And the last tale, "Hiyoku no Tori" (A happily married couple) -- and why this title wasn't translated into English is a mystery -- follows a warrior lost in the swirling mountain snows, trying desperately to make it home to his fiancee. He sees a pair of mated white herons and, angry at the birds' happiness while he suffers, shoots one dead. That act comes back to haunt him as he loses his way deeper in the mountain. The short epilogue also ends with a slight twist as the Snow Goddess herself speaks about the tears that create the snow. Like drifting snowflakes, the stories are light affairs whose tragedies barely scratch the surface of the heartache that love puts humans through -- nor the human ability to endure the pain, or the inclination to succumb to it. The losses the characters suffer have tender rather than truly painful qualities, so it's difficult to care very much for the characters. The artwork, too, is delicate, influenced by traditional styles of Japanese painting. 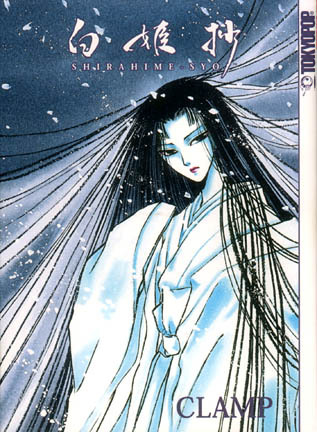 The seeming lack of deep emotion is likely due to cultural differences, especially as U.S. publisher Tokyopop has labeled this collection as "CLAMP's return to traditional Japanese form and storytelling." If so, text or cultural notes would have been helpful in putting the tales in their proper context. For instance, the third tale has a slight double meaning in its title. The Japanese characters, when taken apart, make reference to birds -- and a picture of the heron pair graces the title page. Perhaps the real point of these stories is not so much to create affecting pieces with poignant characters, but to gently remind us all of the preciousness of life and love. The book, in the original right-to-left format, is available in hardcover for $19.99 and softcover for $9.99.